Heat a stoneware container of Belgian chocolate for quick, no-mess fondue bliss. 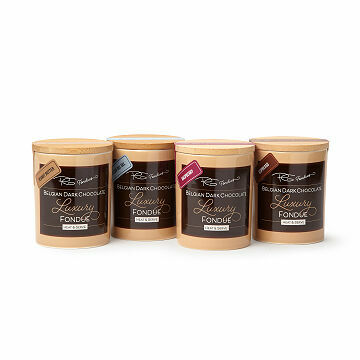 If you are like us, and the words "hot, molten chocolate" stop all brain function, these Belgian dark chocolate fondue pots are made for you. No need to get out the fondue cooker; just place the stoneware container into the microwave, press the button, and enjoy the decadent bliss of Hot. Molten. Chocolate. Dip fruit, angel cake, or whatever you like into it. The container will keep your choice of French sea salt, espresso or raspberry chocolate warm for an hour, and in the unlikely possibility that there's any left over, you can reheat it later. A sweet surprise for a hostess to spring on her guestsbut we won't tell if you choose not to share. Chocolate made in Belgium. Container made in China. Assembled in Sarasota, Florida. Actually ate this with strawberries and pretzels for a decadent dinner. This gift always makes people smile! This was decedent in a good way and made for much happiness! Gave it as a gift...and she loved it! I hope they keep this product available! I bought one for us and one for a white elephant gift! Just a really neat and unique item. Got this for my wife and she loved it. Best chocolate we have ever tasted!